Oh boy, eating healthy through the holidays is rough. We are all trying to incorporate more whole foods into our diets and eat healthier, but there is so much temptation this time of year. Between candy bowls on coworker’s desks, celebrations with friends and family that seem to always revolve around food and alcohol consumption, how are we supposed to enjoy the holidays without completely derailing our goals of eating healthy? Whether your goals are to eat a whole food based diet, maintain your weight, or lose weight, The Food as Medicine Institute has you covered. Continue reading to learn more about substitutions and healthy options for holiday meal favorites, tricks to avoid over-eating at parties, and mindfulness tips on how stay calm and feel successful, regardless of your goals. There are so many nutritious fall and winter foods that can be incorporated into delicious holiday meals. Try adding squash, sweet potatoes, kale, or Brussels sprouts into your next holiday party dish. Pears, citrus fruits and pomegranate are fruits that are in season this time of year as well. Besides the freshness and deliciousness of seasonal foods, they are also more affordable. 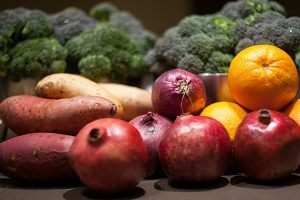 When farmers harvest an abundance of produce because the crop is in season, the cost of produce is reduced. Buying seasonal produce often ensures that it is locally produced thus, the travelling expenses and storage is not required, and production costs are reduced. When it’s cheaper for the farmer and the producers it is cheaper for the consumer. Seasonal foods are fresh, cheap, and more nutritionally dense! Many traditional holiday recipes already incorporate these in-season foods. Try to avoid or minimize added sugars in preparing and get ready to impress friends and family with your seasonal winter food dishes at the next party. A sustainable key to healthy eating, that can be incorporated any time of the year is mindful or intuitive eating. Pause and ask yourself two questions before eating: Am I hungry? And, is this food worth it? The purpose of eating is to nourish our bodies; so, ideally most of the food that we are consuming is to satisfy feelings of hunger. Sometimes we eat because food tastes good or we are bored or everyone else is eating it, not necessarily because we are hungry. There isn’t anything inherently wrong in this, food is meant to be enjoyed, to make us feel happy and nourished. But, how often do we eat something that doesn’t taste that good, or that we didn’t really need and we only ate it because it was in front of us? Taking a moment to pause and ask those two important questions, Am I hungry? Is this food worth it? can help us to only eat food we genuinely like and enjoy. For more information on mindful eating, check out Melissa Hartwig’s new book Food Freedom Forever. This time of year is about gratitude, family, and connection. For many people, food is a way to connect and show our love for one another. There are ways to spend time with the important people in our lives and share our love for them that do not necessarily involve over-indulging in sugar and alcohol. Try setting new holiday traditions with loved ones that revolve around quality time instead of food. Go to a holiday play together, host a party where people work on DIY holiday presents, or bundle up and go for a walk in your neighborhood park. Our modern lives are so busy. This time of year can get especially hectic as we try to balance everything; it’s even more important to remember why we celebrate in the first place and make time to connect genuinely with our loved ones. Failing to plan is planning to fail. This time of year can be stressful and busy from social gatherings and hosting parties, to trying to get everything done at work before the New Year. Planning ahead is crucial for implementing successful habit change. If you know you are going to be at a holiday party with a lot of unhealthy options, try eating a protein rich snack or small meal before you leave. If you are satisfied with a full stomach, you will be less likely to over indulge on six ginger bread cookies. This is also true for grocery shopping. When we grocery shop hungry, we are much more likely to grab the quick, highly marketed snacks that are at the end of the isles. The best way to avoid eating these nutrition-poor food options is not to not bring them home in the first place. Meal planning is another great tool for sticking to healthy eating goals. Meal planning simply involves sitting down and planning out your food for the week. Research shows that when we are implementing new habits, planning ahead keeps our brain happier and makes it easier to stick to our goals when something unexpected happens. For example, when we have planned ahead and have a healthy meal in the fridge waiting for us when we get home, we are much less likely to grab take-out on the way home from work. None of these tips are designed to make anyone feel guilty about their food choices during this time of year. In fact, they are designed to empower readers to feel in control. No foods are inherently good or bad, and it is up to us to decide what foods make us feel healthy and nourished and what foods are just not worth consuming. There is a lot of emotion tied around food, and as a culture, we love connecting with food and preparing meals for those we love. In practicing moderation, we can keep seasonal fruits and vegetables in mind when we prepare meals for ourselves and the people we love. We can opt to connect with quality time instead of food. We can plan ahead so that most of the food we eat is nutrient dense and cooked at home. 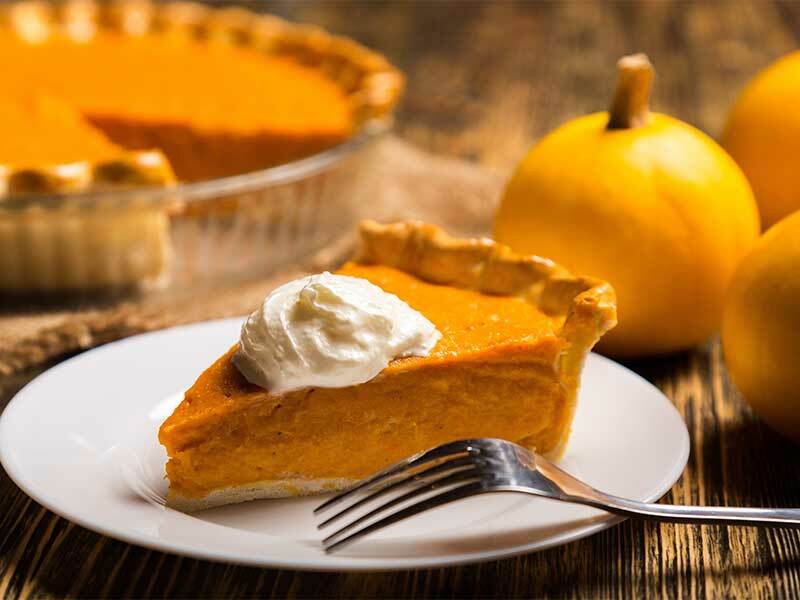 We can decide that our Grandmother’s pumpkin pie is in-fact worth it, and make that choice mindfully and enjoy every last bite without guilt. Regardless of how you celebrate this time of year, I hope this post helps you to feel empowered in your food choices.